The socialists never really payed attention to the colony and its population, despite the fact that theyr were present in the administrative boards of large colonial companies. In the 1950s, this partly changed. A few militants of the socialistist trade union F.G.T.B. (A.B.V.V. ), Congo section, strove for the economic and political emancipation of the Congolese population. This collided with the policy of the socialist party. 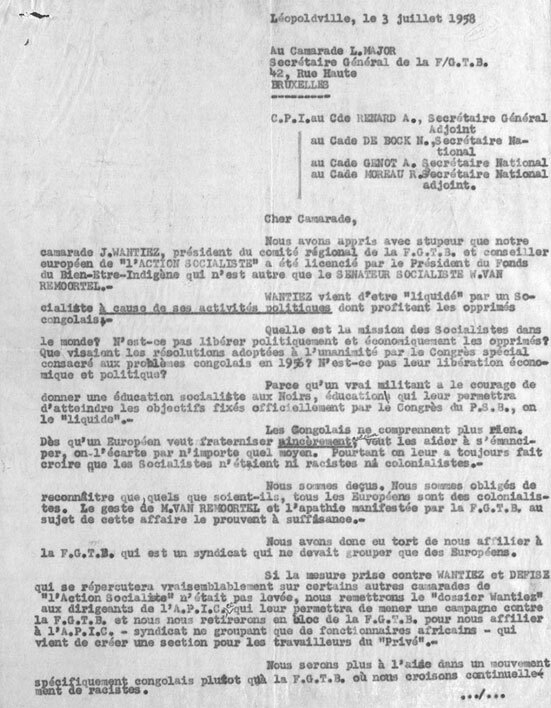 Received letter about the clash between F.G.T.B., Congo section, and the socialist party about the 'Wantiez affair', 1958. NAB, Papers Ernest Glinne, box 3.